This is a curious composition. It functions, as do so many other Japanese woodblock prints, on many levels. It has a loose relationship to the kabuki theater, a prominent restaurant, a New Year's celebration, prostitutes and the Yoshiwara. This is the left panel of a triptych. The full triptych can be seen by clicking on the link to the Kabuki-za seen above. The fellow kneeling in the back is carrying a stylized treasure boat with the easily identifiable dragon-prow. The Seven Propitious Gods were said to have arrived in Japan aboard just such a vessel. 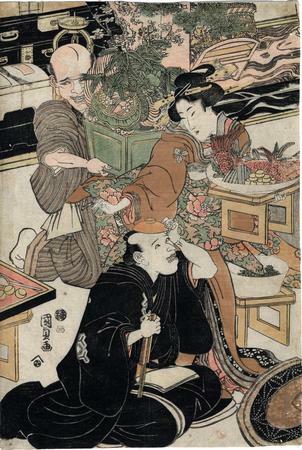 The courtesan in front of him is carrying a low table loaded with a cooked sea bream. There is an extra stamp or seal on this print from the Lyon Collection that does not appear on the other two prints in related inks. That makes us believe that it is a collector's seal because it appears to be a stylized capital "H". It is placed directly below the kiwame seal.